From Calama, we took the 21 North towards San Pedro which was now clearly visible to the North. We got off at the Village of Chui Chui and headed north along the Rio Loa river valley. 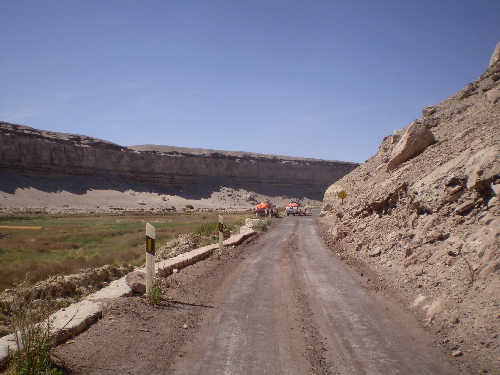 This stop is a tourist attraction as well as a geological stop that is located along the banks of the Loa River on the road from Calama toward San Pedro. 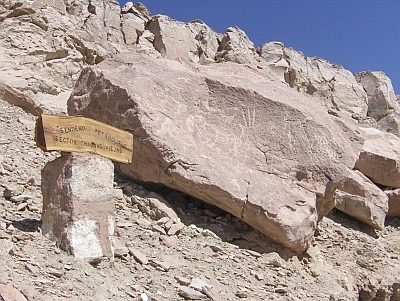 There are petroglyphs carved into the Sifon Ignimbrite (8.1 Ma) also referred to as the Upper Rio San Pedro Ignimbrite. 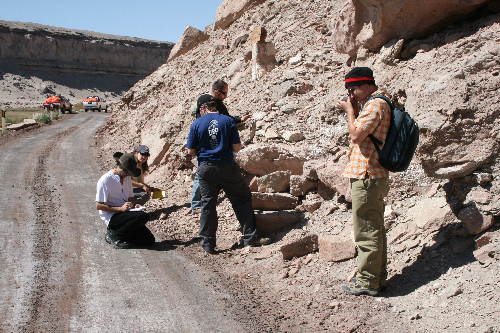 This outcrop represents the most western part of the ignimbrite that continues north to San Pedro. In certain areas of the APVC the deposit is 800 m thick, while here is roughly 300 m thick, indicating that it is relatively proximal to the source or the valley fill. The Sifon is a massive crystal-rich deposit that lacks pumice clasts, and contains abundant biotite and lithics. The deposits underlying the Sifon are Pleistocene lake deposits. There are also ruins on the opposite side of the petroglyphs that are most likely “Pukará de Lasanna” from Quechua Pukará, signifying “fortress”. Lasanna is a small village located 40 km northeast of the city of Calama and 8 km north of San Francisco de Chiu Chiu in the Antofagasta Region of northern Chile. The main cultural attraction of the village is a pre-Columbian fortress built in the 12th century that was declared a national monument in 1982. Peppercorn trees and desert sage characterize the landscape in the area and camping is possible in the campground adjacent to the ruins.